Student: Then a timing error can be corrected by increasing the motor output in the time domain as an increased difference in step times of the limbs. Student: Aha! Look at those curves. The time course for changes in the calculated error signal is very clear. Professor: And more importantly, the increase in calculated temporal motor output appears to be closely associated with the dropping error signal approaching zero. Student: Then the mirror opposite happens during deadaptation. The full derivation of Sdesired is also given in APPENDIX B. Student: Again; the very rapid error resulting from ‘splitting’ the belts is very impressive! Compared to the timing changes, the positioning adaptation seems much slower. Professor: I agree. Otherwise, the adaptation and deadaptation are very similar. Sout is like Sout as a parameter to characterize motor ouput change to reduce spatial error. “Results from experiment 2 indicate that the temporal motor output can be adapted during split-belt walking when the adaptation of spatial motor output is consciously prevented. This finding signifies that the spatial and temporal adaptations are dissociable. Group averages of spatial and temporal motor outputs of subjects in the Control and Spatial Hold groups are shown in Fig. 8. We observed that Sout in the Spatial Hold group does not change during adaptation, whereas there was a clear change in Sout during adaptation in theControl group (Fig. 8A). This is indicated by the significant interaction between group and epoch [F(4,38) = 5.13, P < 0.01]. To verify that the Spatial Hold group did not adapt their leg configuration, we tested for epoch effects for the ankle and knee angles and found that they did not change significantly across epochs [F(4,24) = 1.03, P = 0.41 for ankle; F(4,24) = 1.37, P = 0.27 for knee]. We found that the Control group displayed a significant change in Sout from early to late adaptation (P < 0.001), while the Spatial Hold group did not (P = 0.22). Consequently, the new stepping pattern learned during split-belt walking was stored in the Control group, as indicated by the significant differences between baseline and early deadaptation Sout values (P < 0.01), but not in the Spatial Hold group (P 0.23). Conversely, while there were differences in the adaptation of spatial motor outputs across the Control and Spatial Hold groups, both groups adapted their temporal motor outputs similarly [F(4,48) = 1.11, P = 0.36; Fig. 8, B and D]. We observed that there was a significant effect of epoch in both groups [F(4,48) = 19.44, P < 0.001]. In both groups, Tout had significantly different values between early and late adaptation (P < 0.001) and there were significant differences between baseline and early deadaptation (P < 0.001). This indicates that in both groups the changes in Tout with adaptation were stored (Fig. 8D). In conclusion, we demonstrated with this experiment that subjects can adapt their temporal motor output without adapting their spatial motor output — dissociating temporal and spatial adaptation of locomotion. Additionally, we attempted to prevent the temporal motor output from adapting but found that this was not as easily accomplished as clamping the spatial adaptation. 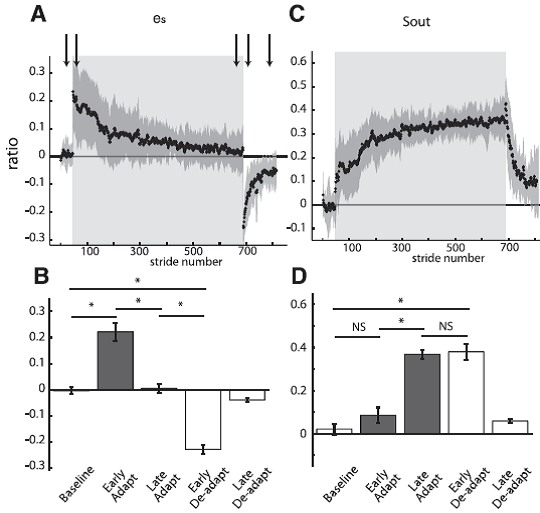 Subjects were provided with an auditory cue of when to land their feet—a symmetric rhythm (i.e., Tout = 0). However, we found that healthy adults were not able to prevent their temporal motor output from adapting. “Here we describe two parameters that characterize temporal and spatial motor outputs for locomotion. 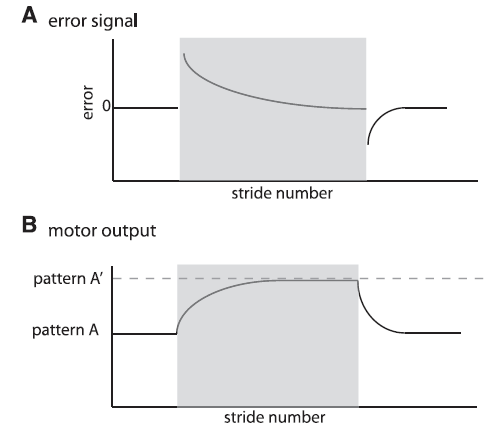 The temporal motor output is a normalized difference between step timings (i.e., stepping rhythm), while the spatial motor output is a normalized difference between limb angles at heel-strike (i.e., stepping pattern). Both these motor outputs adapt in order to regain temporal and spatial symmetry. Importantly, in this study we were able to dissociate the adaptation of temporal and spatial control. Although the nervous system typically adapts both temporal and spatial parameters, we found that there is more consistent and tighter control of the temporal motor output, suggesting a priority in the adaptation of timing. Moreover, this tighter control of the temporal motor output could also suggest distinct neural structures that control more precisely the adaptation of the temporal control versus the spatial control of stepping in locomotion. In sum, these results suggest that there are separate neural mechanisms that control temporal and spatial locomotion parameters. “Numerous parameters could theoretically capture motor output behavior in walking, particularly since it is a multisegmental and bilateral cyclical movement. … Furthermore, we think that heelstrike is important for the nervous system to control in a feedforward manner, whether it is the duration between heelstrikes or the limb orientation at heel-strike. 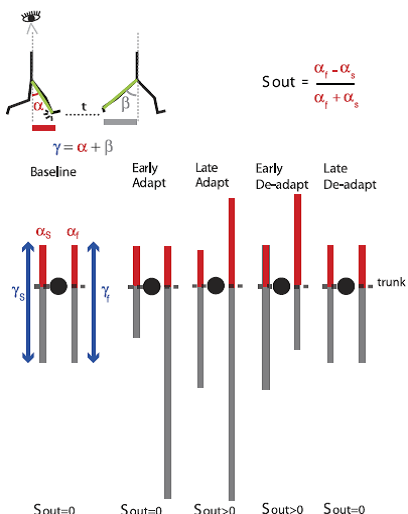 … Since motor outputs have been suggested to represent feedforward adjustments of the nervous system (Smith et al. 2006), this leads us to believe that the temporal and spatial control of heel-strike utilizes feedforward mechanisms to update the subsequent heel-strike. “Our findings show separate control of the temporal and spatial parameters of locomotion in this adaptive task. Some of our previous studies have treated these parameters as if they were controlled by overlapping neural systems and would therefore adapt together (Choi and Bastian 2007). However, our more recent work suggests that temporal and spatial parameters may be controlled, and therefore adapted, separately. Children with hemispherectomies, where one half of the cerebrum is removed, adapted their step symmetry but not their double support errors (Choi et al. 2009). Additionally, we have seen that experimental conditions such as consciously controlling the gait or dual-tasking while walking affected the adaptation rate in spatial parameters, but temporal parameters remained unaffected (Malone and Bastian 2010). In that study, we found that the temporal coordination was adapted at a rate almost two times faster than the spatial coordination, even under “control” conditions in which we asked subjects to “just walk.” Here we see similar trends: the spatial parameters take longer to adapt than the temporal parameters (compare spatial and temporal motor outputs in Figs. 4C and 6C). However, in our prior studies spatial and temporal parameters always adapted, just at different rates. While these findings led us to hypothesize separate control and distinct neural substrates of spatial and temporal control of locomotion, this study allowed us to completely dissociate the two. From our direct investigation into the independence of parameters, we found that subjects could consciously prevent their spatial motor output from adapting while the temporal motor output was unaffected. 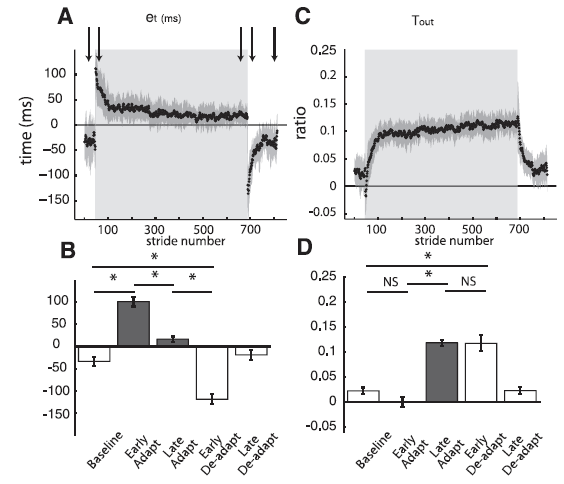 “We also observed that subjects tended to reach temporal symmetry at the adapted state more often than spatial symmetry, thereby suggesting tighter control of the temporal coordination in this locomotor task. Each motor output (temporal and spatial) tended to approach a “desired” value by the end of adaptation that we derived mathematically, using specific error parameters (see METHODS, APPENDIXES A and B). For temporal coordination, the “desired” parameter was a relationship between stance times (Fig. 3, orange lines). In space, the “desired” value was a relationship between the limb ranges of motion (Fig. 5, blue arrows). Not only did group average curves for the spatial and temporal motor outputs approach the group average “desired” values, but these relationships held true with individual subjects as well. When we regressed the “desired” parameter with the final plateau of the motor output for both spatial and temporal coordination, we found significant positive correlations. Although this result was found for both temporal and spatial coordination, the temporal relationship was more tightly controlled than the spatial relationship (i.e., larger correlation coefficients). 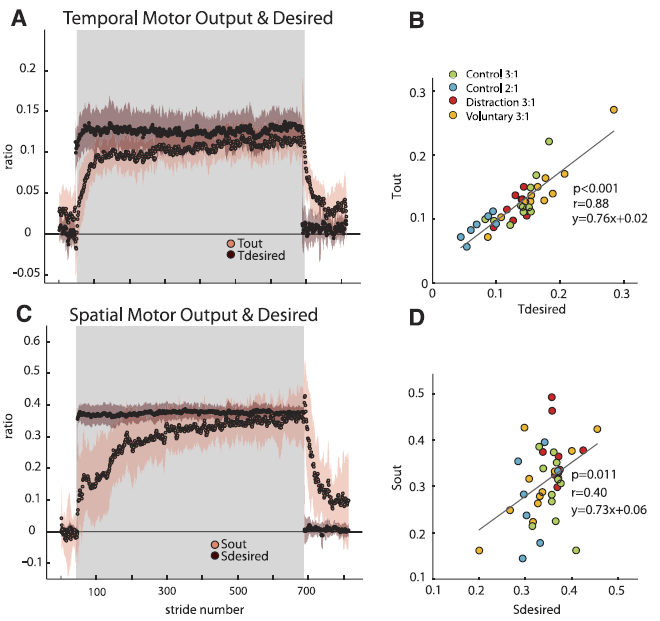 In other words, the temporal motor output was more likely to reach the “desired” value (normalized difference of stance times) than the spatial counterparts. While this suggests that temporal asymmetries are smaller than spatial asymmetries in the adapted state, it is difficult to directly compare the temporal and spatial features because temporal and spatial coordination are expressed in different units in this analysis. Future studies will investigate how temporal and spatial motor outputs can combine in order to equalize steps.